If Foxit Software’s Phantom PDF did nothing other than open multiple documents as tabs, I’d probably like it. My days with stacks of separate windows are over, and unfortunately, that’s the way both Adobe Acrobat XI and Nuance’s Power PDF handle multiple documents. But I also like Phantom PDF because it’s a highly capable PDF editor. For everyday use, it compares quite favorably with the aforementioned competition, and costs less as well. 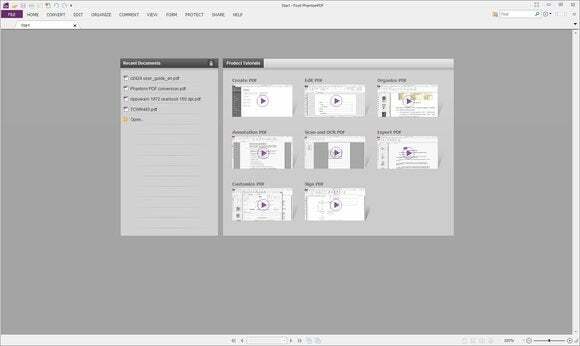 Phantom PDF’s interface utilizes the latest in Microsoft styles with the tool ribbon and Modern UI (Windows 8) look. The GUI is well-organized and easy to navigate. My only complaint, an exceedingly small one, is the small size of the type in the leftmost column of the file menu, which looks out of place with the larger text to the right. If I’m reaching that far to find something to complain about, you know things are in good shape. Phantom PDF has all the usual form creation features (push and radio buttons, checkboxes, text fields, etc.) and has a form recognition facility to render existing static forms editable. It also handles password and certificate protection and supports DocuSign signatures. Unlike Power PDF, it doesn’t let you draw a signature, but you can load one via an existing image. Phantom PDF is an excellent editor, but had some trouble with creating PDFs from scans. As an editor for general PDF tasks, Phantom PDF is excellent; annotating, inserting, deleting and altering formatting with the best of them. However, for creating PDFs from scans with images, curved text, odd fonts, and lots of layout elements, not so much. The search-able PDF I created from 15 complex documents wasn’t bad, though a lot text buried in images wasn’t rendered searchable, and the locations of some items were out of sync. But the worst was the Word document Phantom PDF created from the same input—column errors made it 84 pages long, rather than the 25 it should be. Phantom PDF is not in Power PDF’s, or especially Acrobat’s, league in this respect. Please note that this is a stress test designed to push the limits of OCR. 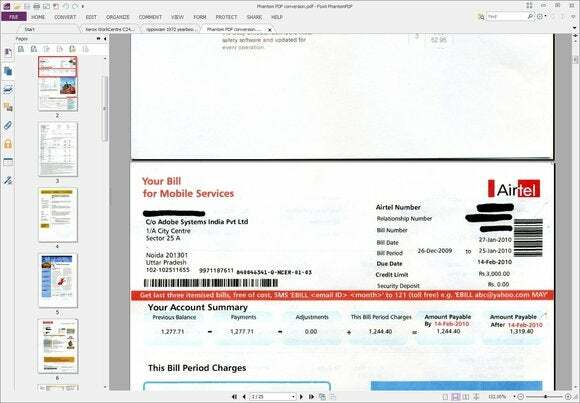 Phantom PDF’s OCR is accurate with simpler, everyday business documents and forms. Phantom PDF 6.1 is available in both $89 standard and $129 business versions. The most salient differences are the business version’s support for PDF/A/E/X creation (the standard version only verifies compatibility for those), image editing, converting text to paths (in an external editor), redaction, and some advanced Active Directory features such as Rights Management Services encryption. For the vast majority of PDF tasks, Phantom PDF’s ease-of-use and broad feature set makes it a top-notch option. It’s OCR with complex scanned documents isn’t the best, but that should’t be a deal-breaker for most users. For considerably less that Acrobat, Phantom PDF provides all the PDF tools most users need. However, it's OCR is noticeably weaker than competitors.